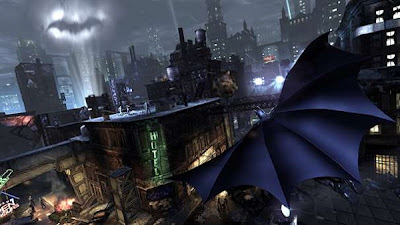 Batman Arkham City is bigger, it's badder, and it's deadlier than ever before. Arkham City feels like a live action comic book putting you in the role of Batman and as the morally ambiguous and provocative Catwoman. You explore the walled prison of Gotham where the criminally insane are allowed to rome free and deal out their own brand of justice. The Penguin, Two Face, and the Joker all struggle for control of this prison city as Hugo Strange acts as the warden of Arkham with some dark purpose in mind. The games plot will twist, it will turn and it will definitely shock you. Nearly every Batman villain you wanted to face off with comes to life. You'll match wits with The Riddler, fight off thugs of the Penguin and investigate, fight, and even make deals with dozens of the characters from the Batman universe. The performances are all strong, most notably is Kevin Conroy as Batman and Mark Hamill as the Joker, both of which have been voicing these characters for 19 years and it really shows. The music and the art are beautiful and the combat really flows, it's not about hitting buttons as fast as you can it's more of a dance. Timing is everything, the better you time your strikes the more experience you're going to earn and that experience buys you gadgets, weapons, upgrades for your armor, and new combat skills. The plot will make you want to run forward, the pacing is so precise that you're going to forget you're playing a game and feel like you're watching a movie or turning the pages of a comic book. Batman Arkham City will leave you wanting more, it will definitely leave you with some heavy cliff hangers, and a lot of questions. And the fate of the next game depends on how they answer those questions. Batman Arkham City has great combat, beautiful graphics, and an excellent story that takes ownership Batman lure just as much as any of the comic books or movies have. I give this game a review of 10 stars out of 10.